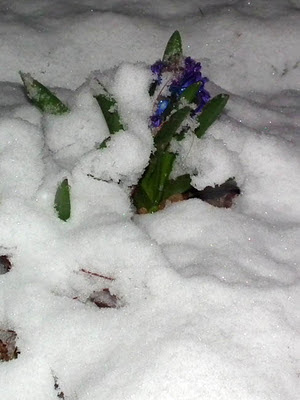 I am pretty sure I will not be the only French blog writer talking about snow this morning. It snowed yesterday. Not heavily, but enough to settle. This is the first snow we have had this winter, and although no more snow is forecast the weather is set to get very cold, with lows of -9C predicted for later in the week. I am not complaing though, as I was getting bored after having four months of October weather. It's just a pity the daffs and hyacinths are flowering, because I assume the snow will do for them. Sunlit Slopes Covered in Vines - Not! 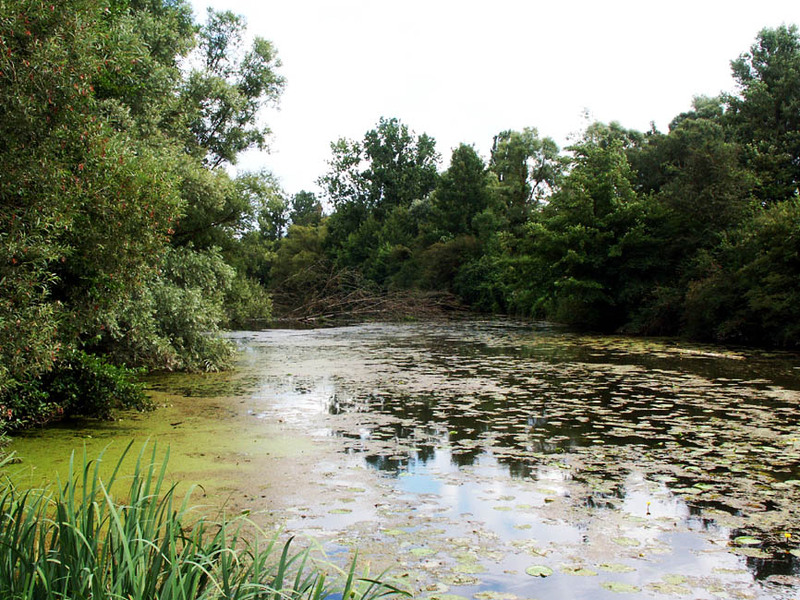 The edition of the Michelin Green Guide to the Loire Chateaux that we own speaks of Preuilly rising on the north bank of the Claise amidst woodland, meadows and vineyards. Ahem...it appears to be quite some time since the nice man from the Michelin guide visited. 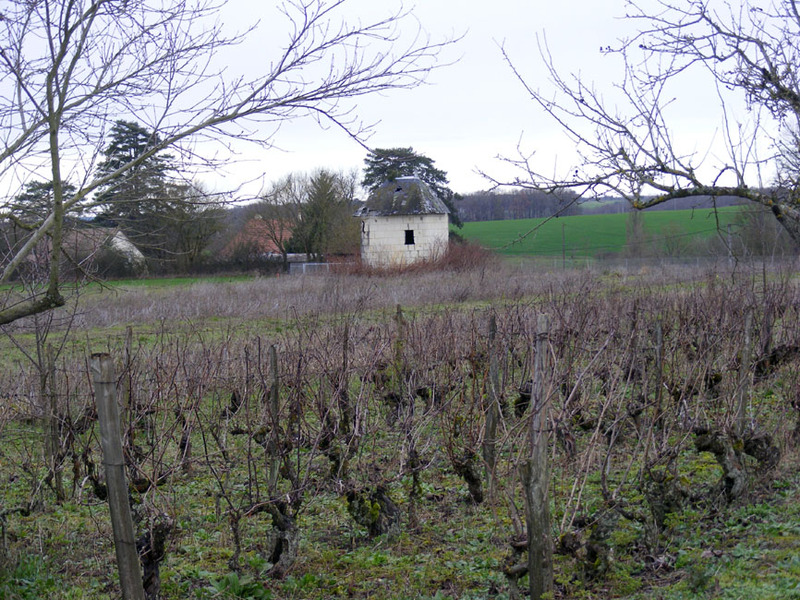 The vines are long gone, but traces of the old agricultural ways are visible everywhere in the form of cabanes des vignes (workers field huts, particularly associated with vineyards). but nary a vine to be seen. Theoretically they have heritage protection, which means you are not allowed to demolish them. Sadly, since they have not acquired a modern use, this means they are simply left to decay and fall down. Their original purpose was to store tools and provide shelter from the elements to field workers while they ate their lunch. The huts usually have a fireplace - much of the work in the vineyards, such as pruning, was done over winter, so a place to thaw out was very welcome. The huts also often have a mini-cellar - just a hole dug in the floor with a trapdoor, which was for keeping your drink cool in the summer. the grapes would once have been more extensive. Now the little buildings, each one of them different, stand scattered about, one every few fields, covered in vegetation and losing roof slates. They are too small to be turned into holiday accommodation, and modern farmer workers hardly get out of their airconditioned tractor cabs, so their only function is to add a sense of delapidated charm to the view. 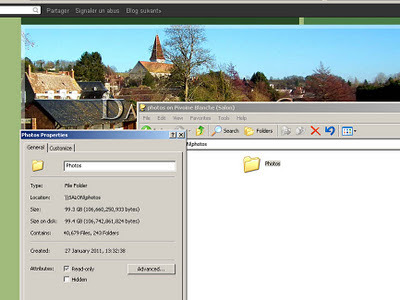 For more information (in French) and photos see the Commune de Preuilly-sur-Claise website. 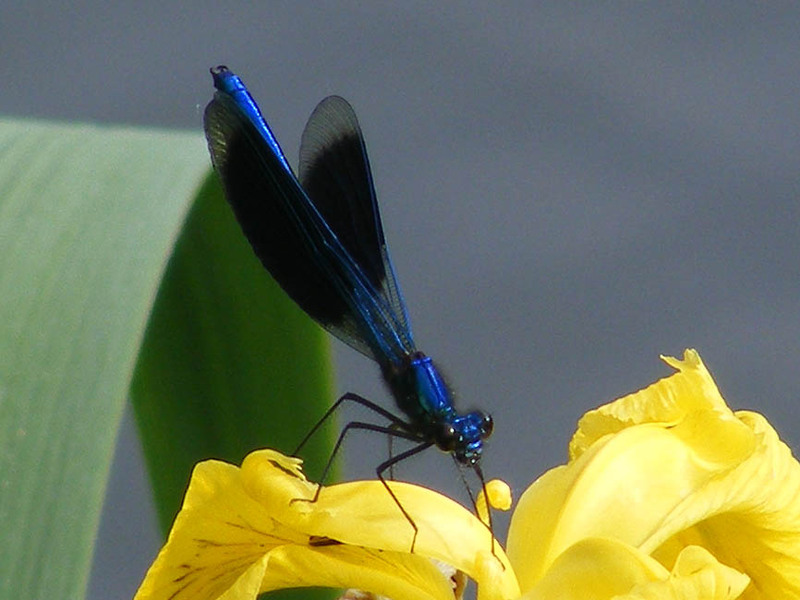 Banded Demoiselles - a photo essay. I strongly recommend clicking on each photo to enlarge them. They will open in a new window. You may have noticed the occasional photo on this blog - whenever we go out of the house a camera is never far away and whenever we work on the house we try to remember to document the changes we make. 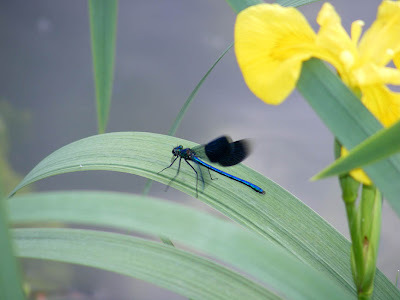 Over the 10 years since we bought our first digital camera we have taken quite a few photos, most of whch I can place on my own individual timeline: if I am looking for a photo I am pretty good at remembering when I went to a place. The problem occurs when I have to find a photo of a specific type of car/tree/roof. So I am looking for photo indexing software. I have tried some, but they all seem to want to put tags on the photos themselves, or change the photos in some way. I need something that does a complex hierarchical tree structure (which counts Adobe Photoshop Album out of the equation) in something that resembles a spreadsheet with links to the photos in their original folders. The other consideration is that it has to be cheaper than cheap. Well, That'll Have to Go! 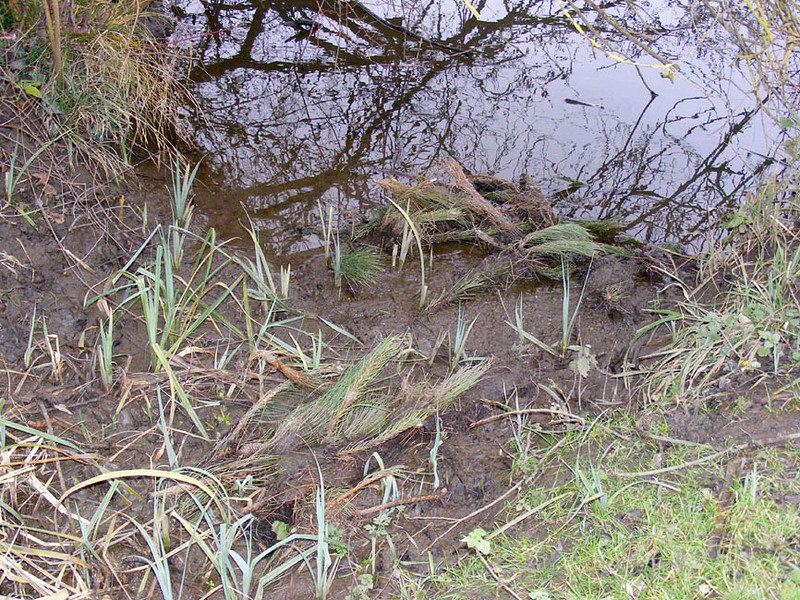 For more than 12 months there has been a tree laying across the river in Preuilly, just upstream from the boat ramp. 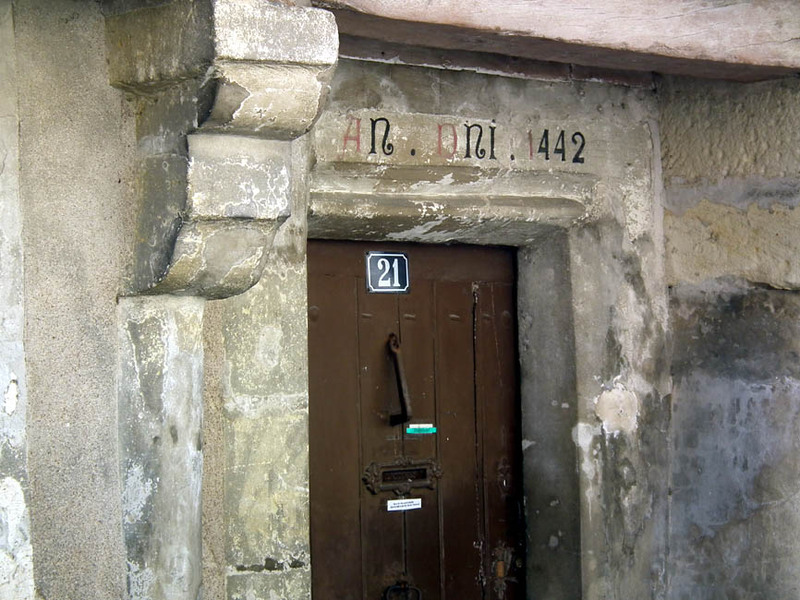 You can see it in this picture taken in 2010. Last year winter was unusually dry and the tree didn't budge. Finally, this year, with conversely generous winter rain, the tree has been pushed down stream - only to hit the barrage (weir) just downstream of the boat ramp. 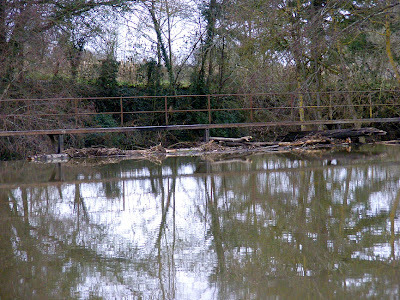 Debris piled up against the footbridge over the weir. 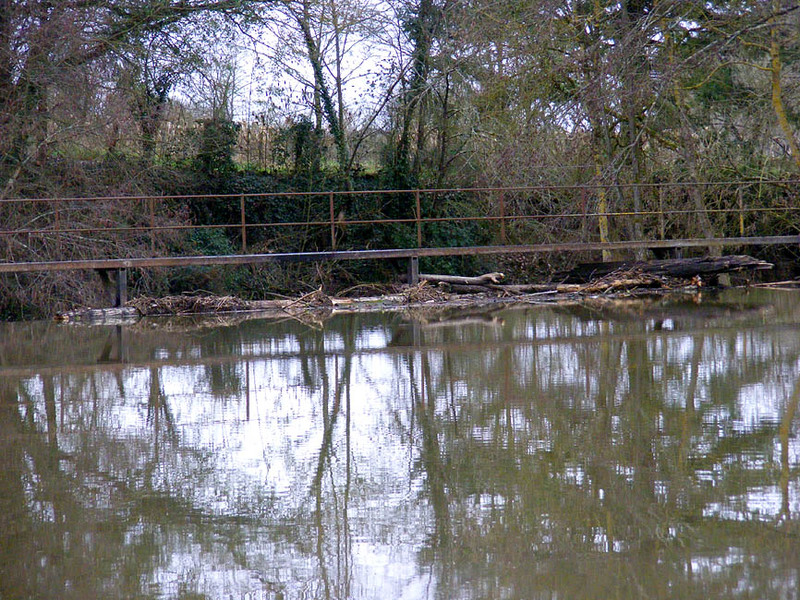 The weir is associated with the Moulin de Chanvre (the Hemp Mill), the last house in Preuilly on the Chaumussay road. The water backs up behind the weir and is diverted down a mill race on the rive droite (right / north bank). The weir is also the border between the communes (local administrative districts) of Preuilly-sur-Claise and Boussay. This is just so you can admire the reflections in the mill pond. So who has the responsibility of clearing away the debris of the fallen tree? 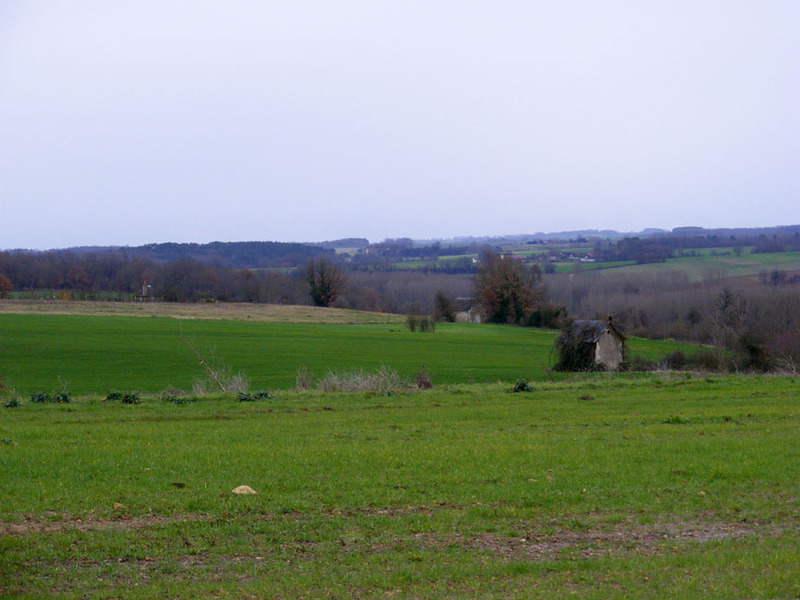 Theoretically the landowner (ie the proprietor of the Moulin de Chanvre) has the responsibility, but mill owners are offered several choices of approach, ranging from doing all the work themselves to having the Office nationale de l'eau et les milieux aquatiques (National Office for Water and Aquatic Environments) arrange everything. In practice, probably Yohann Sionneau will sort it out. He's the river technician based in Preuilly with the Communauté des Communes de la Touraine du Sud (an organisation that all the local communes belong to, allowing them to pool resources). He can probably organise the manpower and machinery via the local council and fund it from a central river maintenance fund. Today is Australia Day, so we like to post something that has an Australian theme, and even better if it demonstrates a link between Australia and France. Last year's post is here and the previous year can be read here. 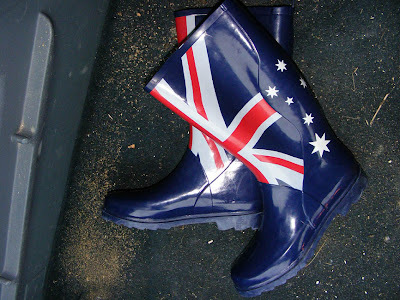 This year I thought I'd introduce you to my new rubber boots. They weren't sent to me by an unusually patriotic friend. I bought them in Chatellerault. They were in Max Plus, a shop that sells off excess stock cheaply. They cost 7€ and are made by Bata. I haven't owned a pair of rubber boots since I was a child, partly because once I became an adult I could never find any that were affordable and fitted around my calves comfortably. Amazingly, these ones do, so that combined with the small price and the irresistably apt motif, I had to buy them. Squelching through the springtime clay of our vegetable garden will be an altogether more manageable proposition this year. At the same time I picked up some good quality jodhpurs for just 15€ a pair. Laughing. Winter in Preuilly is interesting, especially if you're fond of just sitting around in front of the fire drinking cups of tea. I haven't yet made a start on the painting I have to do, because the room I have to paint - the entry hall - is a bit too cold and not conducive for paint drying. 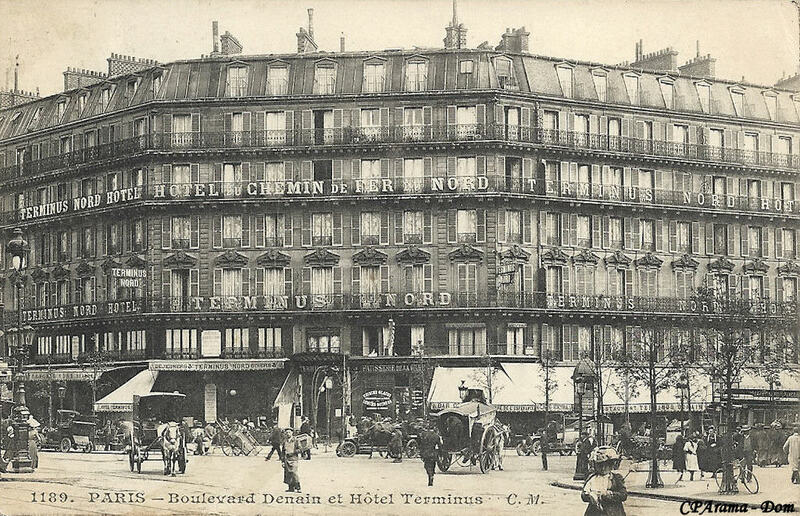 So I thought I would share one of the websites that have held my attention for the past few weeks: CPArama, a collection of old postcards. More specifically, the photos of the Paris metro which can be found here. It is interesting how many options for transport were available for people who could afford it: trams, buses, cars, horse and cart, and how excited people appear to be to have their photo taken. The fashions are pretty good, as well. I am also struck by how empty the streets were, although this may be a function of the photographers working early in the morning so that you could see the street rather than the people. Anyone who knows Paris will love these views and recognise many of them. Even if you haven't been to Paris before type some of the street names into Google Streetview and compare the old views to modern Paris. Many of the buildings are the same, some even with the same businesses trading. On Sunday I went down to the plan d'eau (recreation ground) to get rid of our bottles in the recycling bins (station de recyclage). They were piling up in the pantry, but it was also a good excuse to get down to the river and the ditches that flow into it from the plan d'eau. With the mild weather, things could be happening much earlier than expected. 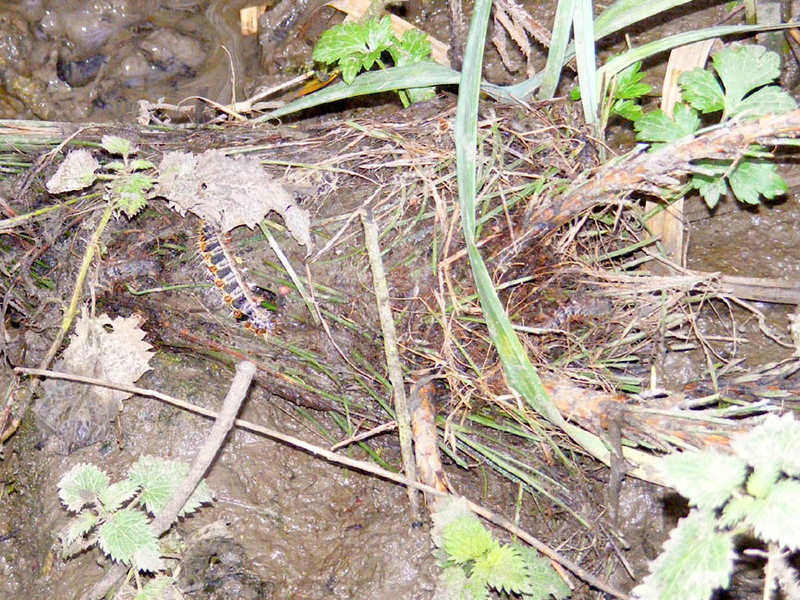 I particularly wanted to check on the caddis fly larvae that live in the ditches. 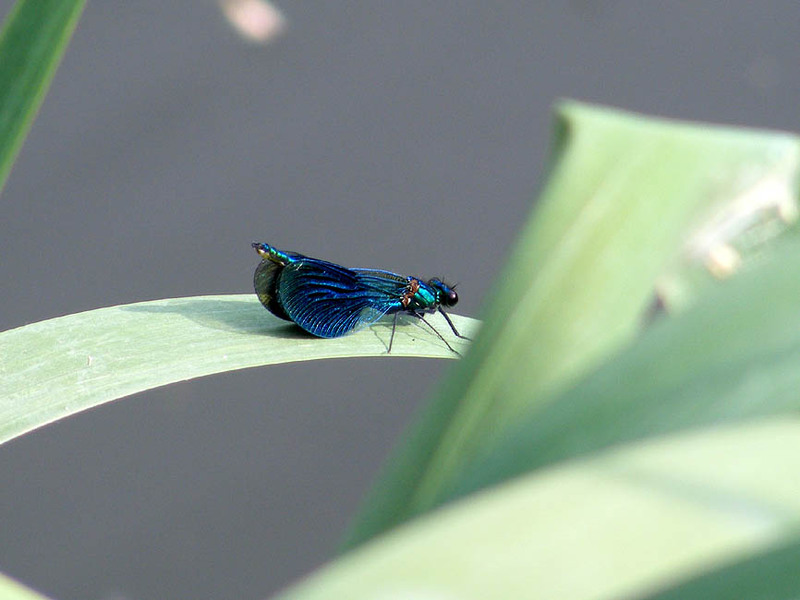 They trundle about on the bottom in their ramshackle owner-built houses of grit and plant material and are a lot of fun to watch through the crystal clear water. There was also the possibility of toad spawn in long necklaces attached to underwater plants. Normally I would wait until February to check for this, but this year, who knows. Anyway, no toad eggs, but the caddis fly larvae were active. 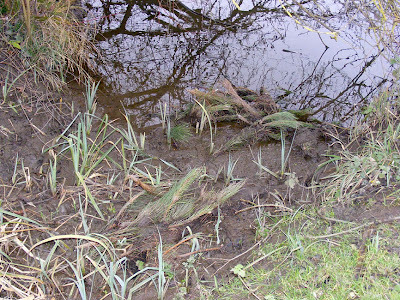 A pile of Pine Processionary nests dumped in a ditch. Where one of the ditches flows into the Claise I noticed there was quite a bit of sludge and plant material, but what caught my eye was a large hairy caterpillar. I realised that someone had dumped a load of pine tree clippings into the ditch. Each of the clippings had a processional caterpillar nest encasing it, and it was clear that it was these nests the culprit was trying to get rid of, not the pine clippings per se. It seemed like a peculiar choice of disposal methods, since the perpetrator must have had to bundle them up and carry them down to the river somehow. Why not pile them up and burn them? That is the standard method of destroying them. Why risk spreading the highly irritant hairs all over yourself and maybe even your car upholstery? My greatest fear is that they were first doused with insecticide which is now merrily washing down the Claise. Yohann, the river technician, is going to be more than a bit exasperated when he finds out. One of the rather handsome caterpillars can be seen centre left. Neil, over on Chez Charnizay, noted in a recent post that the processional caterpillars have been active all winter. They will indeed have been having a very easy time of it in the mild weather, but nothing except the very coldest weather slows them down. They are one of the climate change winners, moving inexorably up through France, further and further north. They are a real problem if, like Neil and Antoinette, you have pine trees in your garden. The nests are high up and you need a cherry picker to reach them to cut them down. 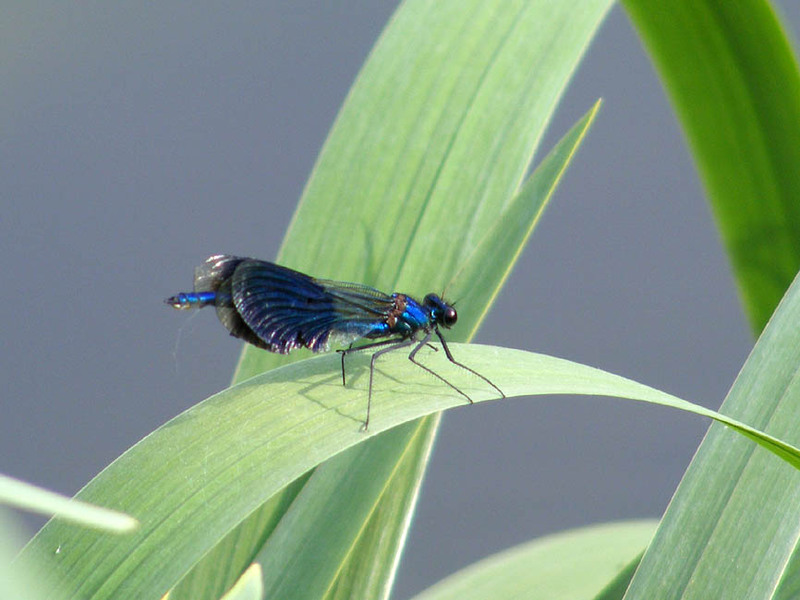 The glass fibre like hairs float down, landing on your pets or the ground or your outdoor furniture. They produce a reaction that ranges from mild discomfort (similar to stinging nettle) to anaphylactic shock. Some people are more sensitive than others, and dogs are more sensitive than cats to the irritant protein the hairs inject. Be careful if you see the nests in trees or the caterpillars on the ground and if you have them in your garden please dispose of them sensibly (by burning or pouring boiling water over them, taking care not to inhale the hairs, washing your clothes and indulging in a hot shower immediately after doing any nest pruning). For more details and photographs of Pine Processionary caterpillars, please go to our other blog, Loire Valley Nature. Acutally, this tree isn't called the Sentinel Oak, or even le Chene sentinelle. 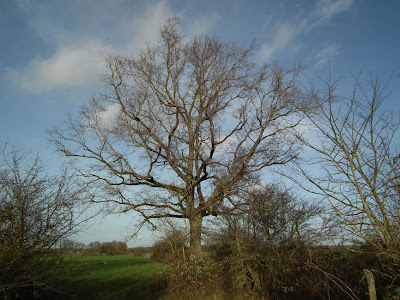 I just called the blog post that because it's the sort of cliched, grandiose name that isolated large trees tend to get. In fact, so far as I know, this tree hasn't got a name at all, apart from its species name, which is Quercus robur (English Oak, French Oak, Peduculate Oak, le chene pédonculé - take your pick). And speaking of clichés, did you know that the word does have the same meaning in French and English, but in French there is an additional meaning, very commonly used but rather different and unexpected if you don't know the etymology? A cliché, as I am sure you all know, is something expressed in a way that is obvious, overused, trite, shallow, predictable, banal, stereotyped. The origins of the word come from the technical world of pre-digital printing, where it meant a proof printing plate (sometimes called a 'stereotype' in English). The current meaning is associated with the practice of casting common phrases as a single piece for the moveable type of these proof printing plates. In French though, this original meaning branched off somewhat and has a second meaning as a snapshot, a photograph or photographic negative. In French books and magazines photographs are often credited as clichés and French people post their clichés de vacances (holiday snaps) on their page Facebook. Dorade (sometimes spelt Daurade) or Sea Bream is my favourite white fish. 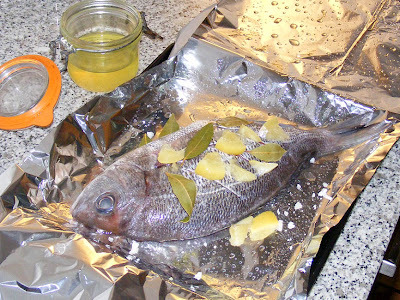 Bream comes in many varieties, both fresh and salt water and can be found all over the world. The prime species in France is the Dorade royale, Gilt-headed Sea Bream, but it is a Mediterranean fish with stocks diminishing at an alarming rate, or farmed with varying levels of ecological care around the Greek islands. It is usually very expensive, with a moderately sized fish weighing between 500 g and a kilo costing 20 - 35 euros. Even if I felt comfortable about eating a fish that doesn't make it on to the Marine Conservation Society's sustainable list, it's way too expensive for us. Just before sealing in its foil parcel. Its cousin the Dorade grise (Black Sea Bream) comes from a different kettle though. Numbers fell in the 1970s - 80s through over fishing in the Atlantic, but it has bounced back now. It is netted along the French Atlantic coast, the Channel, all around the British Isles and the North Sea. Never as highly regarded as the Gilt-head, it is nonetheless a very nice fish. I guess it's the Pollock (Colin) to the Gilt-head's Cod (Cabaillaud). Anyway, when I saw some at the fish stall in the market in Preuilly on Thursday for only €7.50 / kg I was delighted and bought one for dinner costing a smidge under €4. 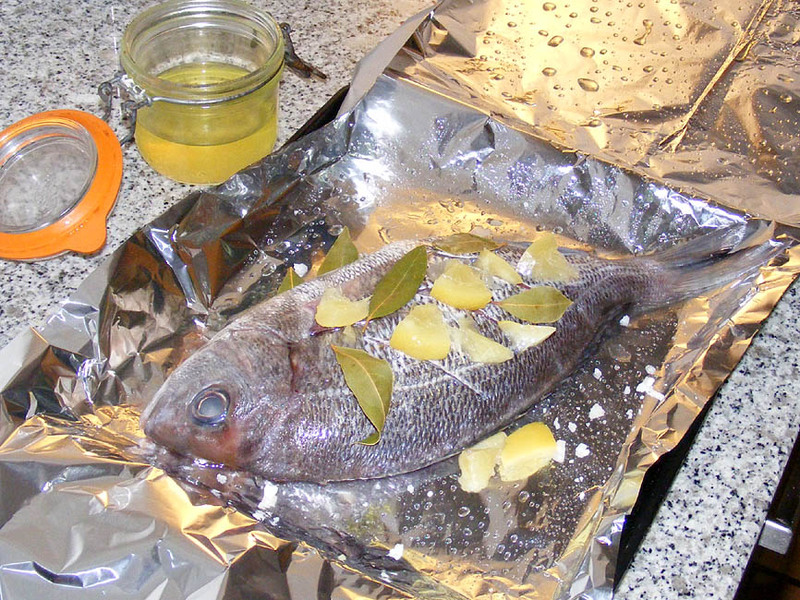 I asked the fishmonger to gut it (vider - literally 'to empty') and cooked it en papillote (in the oven, sealed in a foil parcel) flavoured with homemade North African style salted lemon (citron confit) and bay leaves (feuilles de laurier). 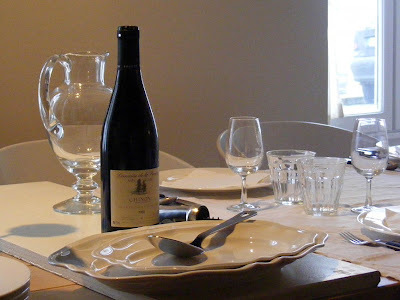 I served it with potato salad and a still white 2010 Turonien Vouvray from Chateau Gaudrelle. I thought it was rather good, but Simon didn't like it, which was a shame. He found the bay too medicinal and can't be bothered with unfilleted fish. I've never really understood what the term 'fine dining' means. I guess it's one of those amorphous phrases that means what you want it to mean and everyone has a slightly different interpretation, based on personal tastes. The meal served at this simple and elegant setting was the ultimate French peasant classic, poule au pot, and the venue was a private house. J and H were relaxed and generous hosts. So, does that count as fine dining or not? I'm guessing not, but who cares. I'd much rather be somewhere by invitation where the food was prepared with the enjoyment of friends in mind. Yesterday we had our second delivery of wood for this winter. Contrast this with our first year here where we were getting wood every 3 weeks or so, and you will realise how much difference insulating the house has made. Even though this winter has been almost tropical compared to the last two years these old stone houses do get cold - even on midsummer mornings it can be chilly inside. 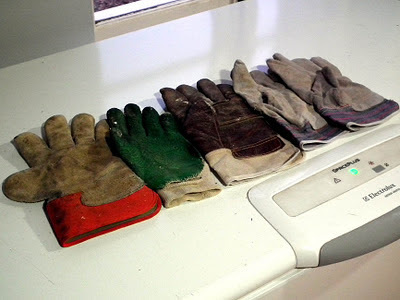 Yesterday Edouard delivered a couple of steres of wood, so I searched out a pair of gloves so I could help unload (so what if I have delicate hands - I'm an artiste). Couldn't find a pair. Plenty of gloves, no pairs. Even worse, plenty of gloves: all for the left hand. PS Edouard has just taken on a new allocation of trees in the forest and has managed to knacker his right arm by sawing and carting 100 steres of firewood in less than a week. PPS Assuming this current delivery of 5 steres lasts the winter out, our heating expenses come to under 400 euros for the 2011-12 season. A total of about 9 steres, compared to about 14 last winter. 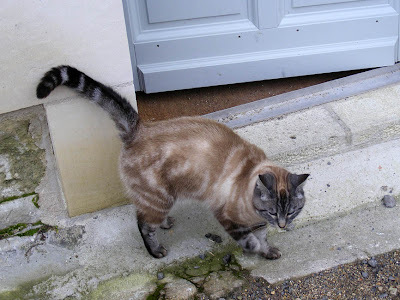 We visited the chateau of Azay le Rideau nine times last year. This meant that while Susan visited the chateau I had 18 hours to explore the town on my own. 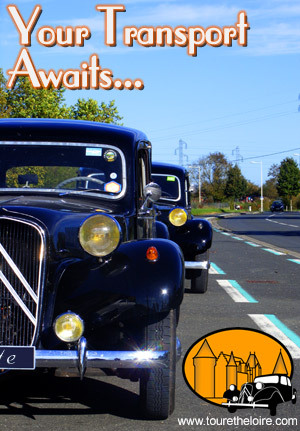 This is good news, because the town has plenty to offer people prepared to get off the well worn trail from the carpark to the chateau gates. 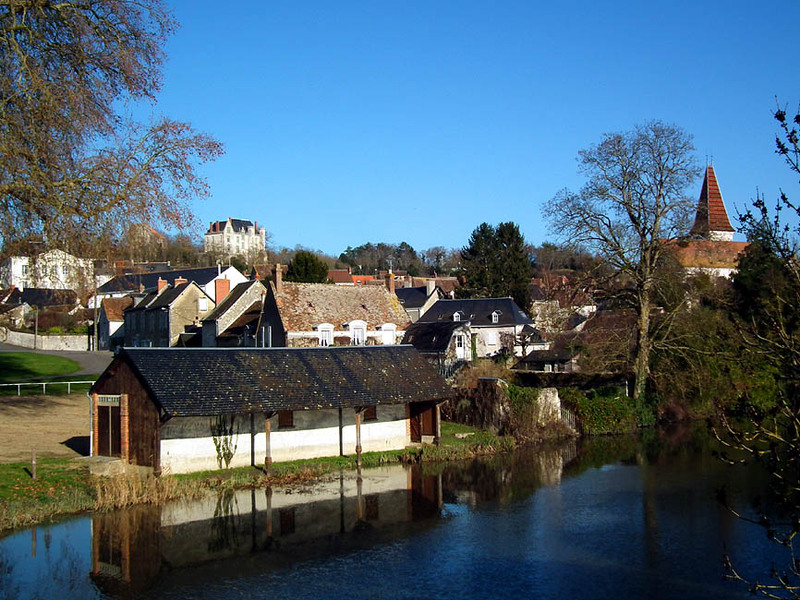 The town dates to 1442, the date its current bridge across the Indre river was built. Before that time there was a town on the site, but owing to an insult paid to the Dauphin Charles VII in 1418 by the garrison of the Duke of Burgundy who was stationed there, he besieged the fortress, captured 350 Burgundian soldiers and then burnt down the castle and its fortifications, the town and the bridge. From the road it appears that there is only one house dating from the time of the rebuild, but I wouldn't be surprised if the bones of many of the houses in town are that old. This building is here. 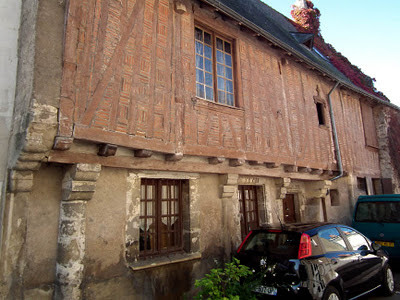 I have a lot of photos of interesting buidings in Azay and will be posting them here from time to time over the coming few weeks. 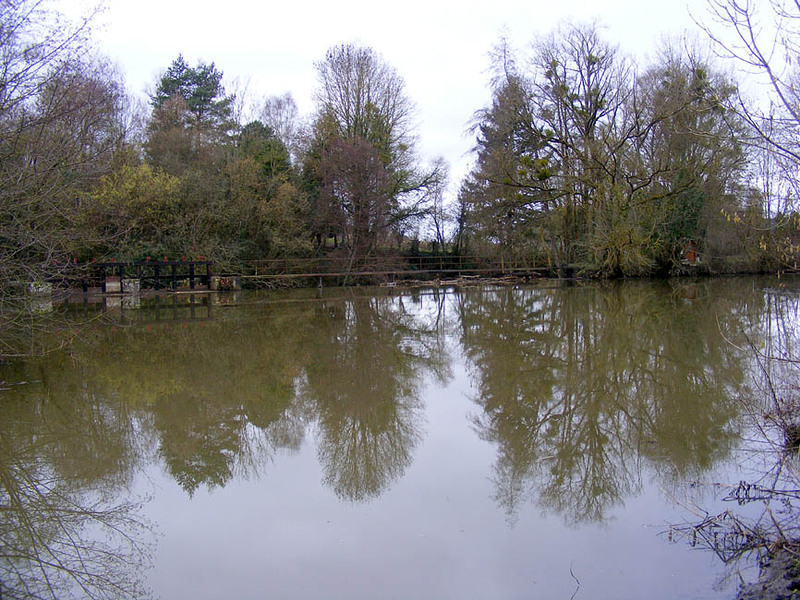 Next time you're in Azay, spend an hour walking around - it will repay your time. It's that time of the year again - where I look through the thousands of photos I have taken because they were interesting at the time, but which I haven't yet written about. The work we did in the window in the dining room is one such item. 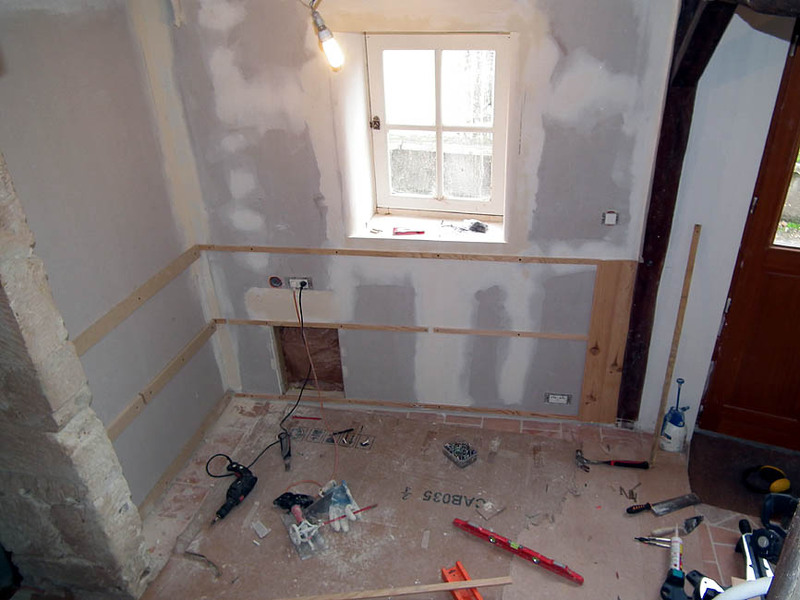 When we were insulating and lining the wall of the dining room in December 2010 I mentioned that it would be nice if we could introduce some curves into the scheme of things - placo is great at doing straight lines, but everything was starting to look very flat. Rather than do anything too radical (and time and money consuming) it was decided that we would put a bit of a radius on the very deep windowsill. We hoped it would have the effect of making the wall look more solid than just placo, as well. We used 5cm béton cellulaire blocks. 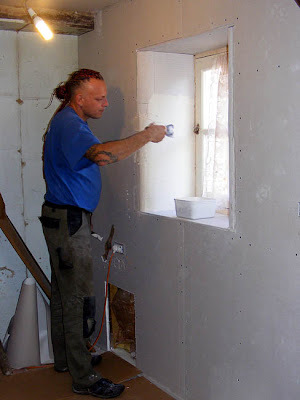 These are the very light cement bricks, full of air and cuttable by hand, that we had used on part of the upstairs bathroom wall. We just glued them to the placo, shaped them using a hand rasp, then plastered and painted them. I think they work really well, and am really pleased we took the decision to do something slightly different. Early January is the season of the galette des rois in France. Galettes des rois come in the classic version, which is two discs of puff pastry sandwiched together with frangipane (a paste made from ground almonds, sugar, eggs and butter). Fancier ones have fruit (often pears) or more exotic nuts. Ingrid and Huub brought us a very nice pistachio one purchased at LeaderPrice recently. More recently still, Chris and Annie brought us a galette hollandaise. None of us had encountered one of these before. It had the usual accessories - gold cardboard crown, ceramic feve (in this case, in the shape of a Tour de France yellow jersey wearer). It was particularly good and was made by their local boulangerie-patisserie I think. Tim and Pauline stayed to lunch after an excursion to the Preuilly market to buy bitter oranges for marmalade, and some wedges of galette hollandaise went down very well with homemade proper custard (egg yolks leftover - for once - due to Simon's current macaroon baking phase). A nice thick layer of frangipane inside. 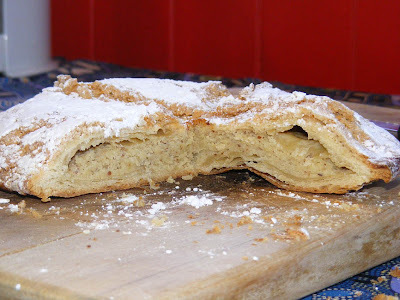 I really should get round to making one of these seasonal galettes myself, so, curious to see what made the difference between the ordinary ones and the 'Dutch' style ones, I searched for recipes. Apparently the galettes hollandaises have a macaronnade spread over the top (basically a frothier version of the filling). This looks like a good recipe, which I might try in due course. We had winter yesterday, and it's likely to continue for the next few days. Not nasty, dark, wet, misty, clammy, chill through to the bone winter, but hard frost followed by sunshine winter, just like I remember from growing up in Canberra. 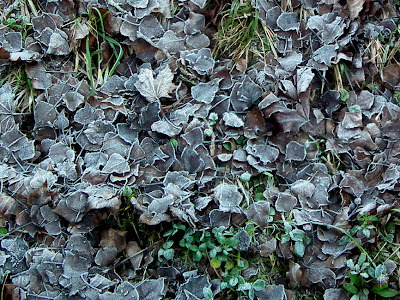 It was -5°C overnight, and the frost lasted all day even though the temperature supposedly reached +5°C. 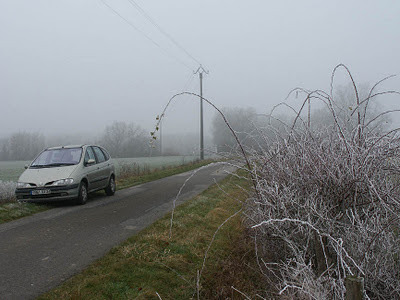 This morning we are forecast the same temperature (for some reason, the temperature is at its lowest after sunrise), with icy roads and mists. I will not be reporting back about the accuracy of the forecasts. 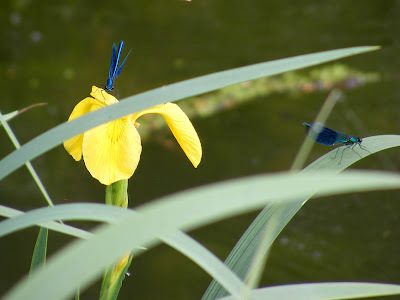 The new blog header was taken at about 2.45 yesterday afternoon. It looks beautiful, but I should have worn my gloves. 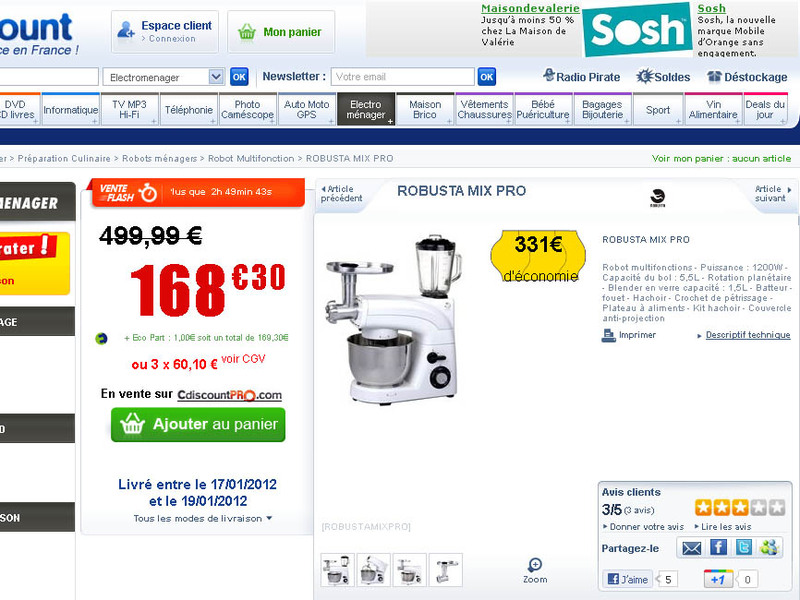 Twelve months ago I wrote about the soldes and our attempts to buy a cooker. That turned out rather well in the end, with us being able to purchase an Italian brand of cooker we had never heard of at a remarkably good price, and making two wonderful new friends in the process. 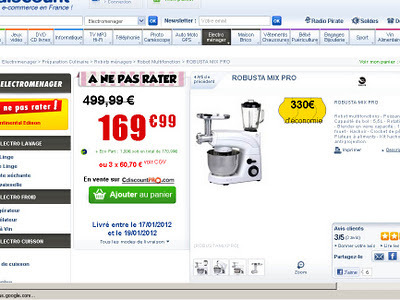 1.00am Saturday morning, and the price had increased 1€69. 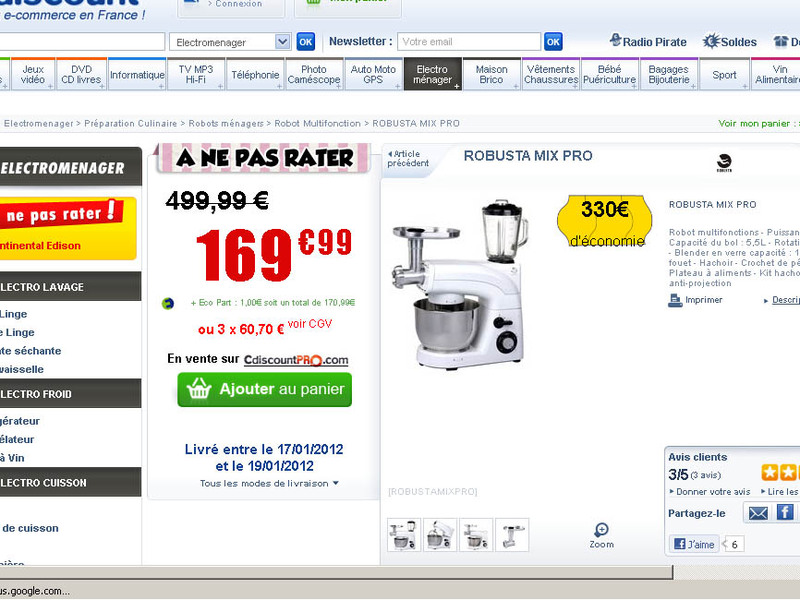 We think this mixer is more or less what we are after - it certainly reads like what we want. 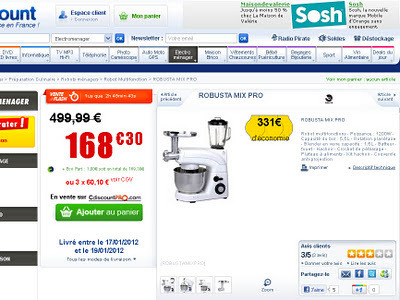 The problem is that like many French appliances they only seem to be offered by a few online stores so we have never seen one in the flesh. I am still confused about prices, though. PS If any of our readers have experience of Robusta or Clatronic mixers, we would be very interested in hearing their thoughts. The Kenwood KMix is still in the running, and is clearly a good machine. But - it is much more expensive than the French Robusta or German Clatronic models, and we are wondering if these less well known brands might give us better value for money. Pepsi cruises by in April. As devoted viewers of QI will no doubt recall, if you put a Siamese cat in a refrigerator it goes black. That is because the hair is temperature sensitive. The fur on the face, tail and feet ie the extremities, are always cooler, so always dark. 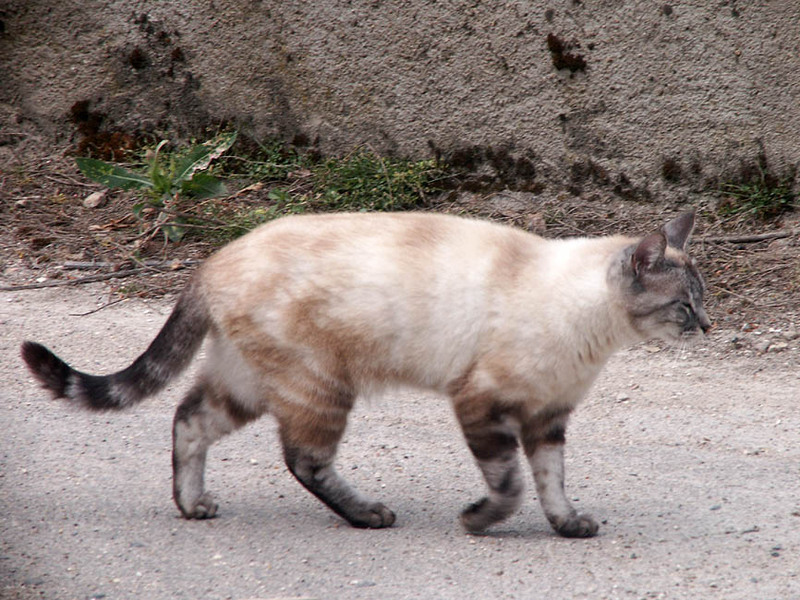 However the body fur is warmer and stays pale. Pepsi just released from a fortnight in the fridge*. It's to do with an enzyme in the hair called tyrosine. The enzyme is involved in the production of melanin, a brown pigment, but it is heat sensitive, breaking down if the temperature goes up too much. *Or possibly photographed visiting in the January cold. Last week macaroonies, this week gingerynuts. This is a variation on a Delia recipe (which can be found here). I made it slightly more "growed up" by substituting the margarine with butter, using treacle and honey, and doubling the ginger. You need to extra ginger, because treacle has so much more taste than golden syrup. Sift flour, ginger and bicarb. Add sugar. Add syrup and mix in. 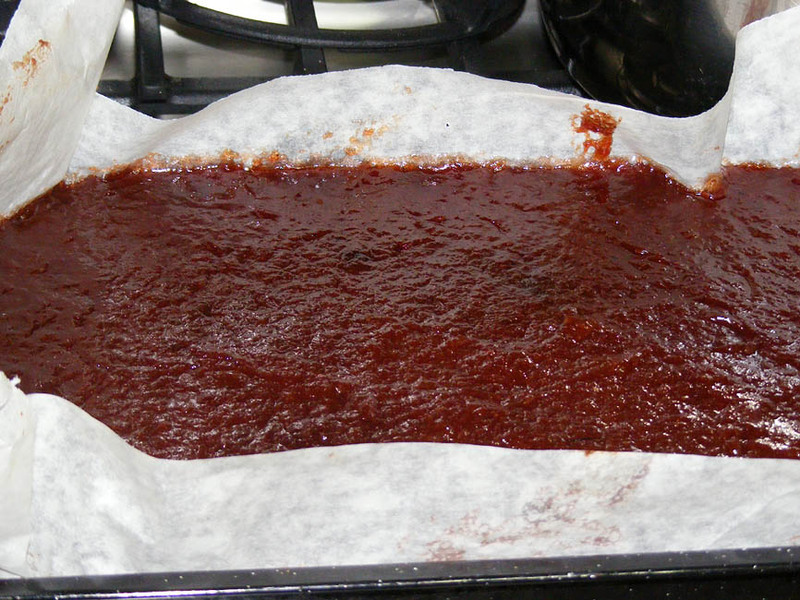 Make 16 balls of the paste, put on a lined baking tray and flatten slightly. Leave plenty of room between 'em. Cook for 10 minutes in a preheated oven at 190°C oven. 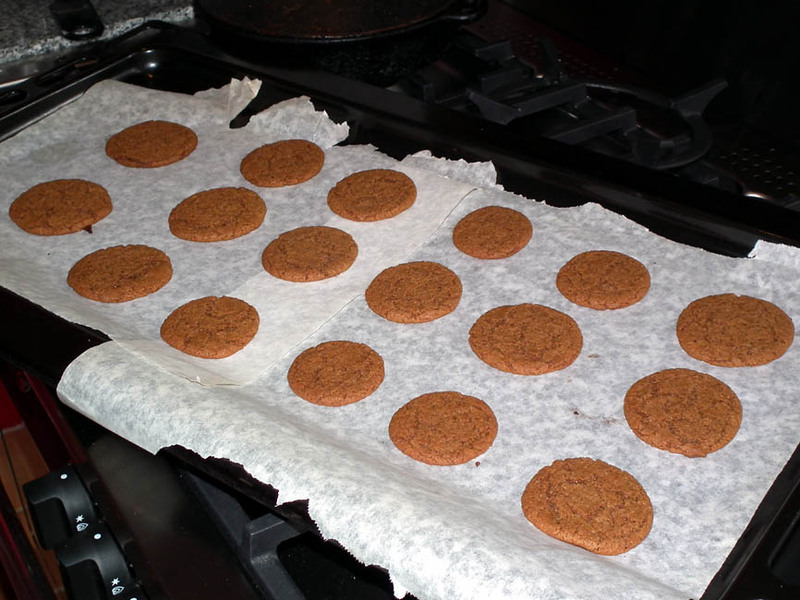 Once they look like gingernuts remove from oven, and when they can be handled without burning your fingers or falling apart remove from the baking tray and put on a wire rack. I like making bisuits, because you need to make more than one batch to get the recipe right - but even the failures aren't all that bad. Quince trees thrive in the Touraine. 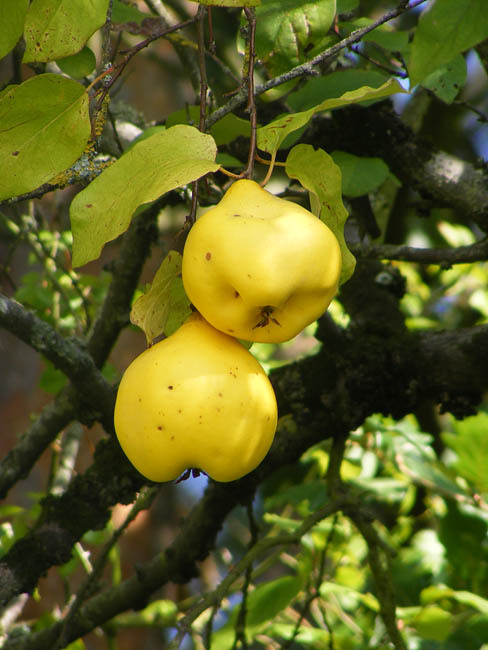 We don't have one in the orchard, but our neighbour does, and as quince trees produce large quantities of fruit, we benefit from periodic gifts of quinces. They are an old fashioned sort of fruit and our elderly neighbour is delighted that I like them and, perhaps more importantly, know how to cook them. Quinces on a roadside tree in September. Being large, they are the last of the fruit to ripen and are ready in late September - October. I poached a few, but most of them went to make jelly (we have already eaten every jar) and I ran the pulp that remained after straining for jelly through a food mill to remove skin and seeds. It sat in the freezer until a week or so ago, when I got it out to make quince paste. Molten lava countered with a mesh lid. Quince paste seems to have originated in Turkey and from there made its way to Spain and Portugal. 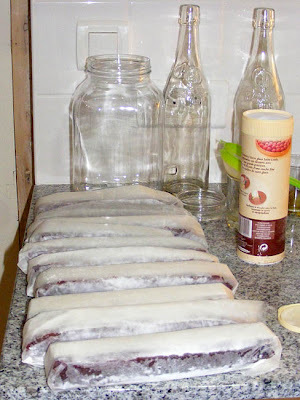 In English language cookbooks it is often called membrillo, which is the Spanish word for quince. 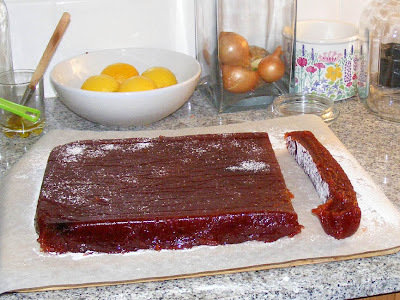 Quince paste in Spanish is called dulce de membrillo. The French for quince is coing, so quince paste is pâte de coing. In England it is commonly referred to as quince cheese, and this is how I first encountered it, at the farmers market I shopped at regularly in the late 1990s-early 2000s. It is used both in a sweet and a savoury context, as a counter to strongly flavoured cheeses or game and as a petit four or friandise with coffee. In France it is regarded as a seasonal treat, made in the autumn and served over the Christmas - New Year period. The stiff dark paste just out of the oven. To make it you combine an equal quantity of quince pulp and sugar in a large boiler. 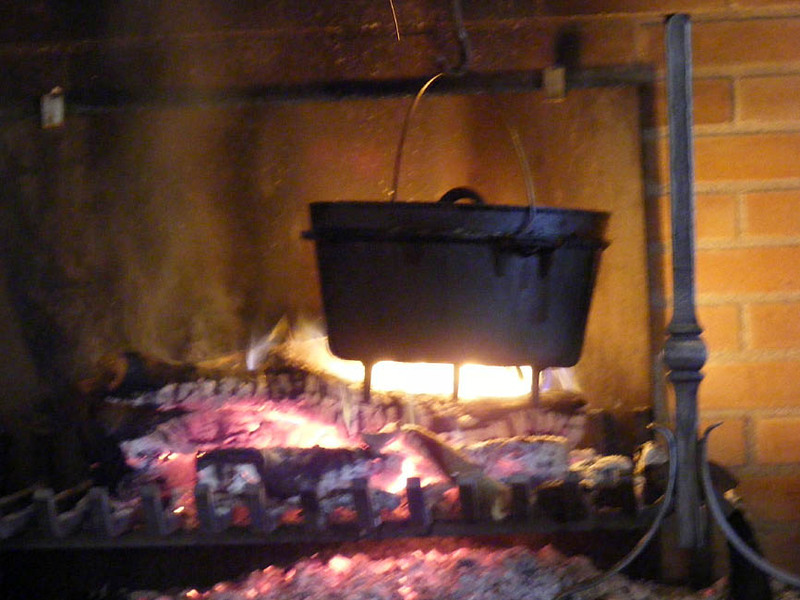 Heat it slowly to dissolve the sugar and then simmer for about 1.5 hours, on the lowest possible heat. It burns easily, so check it regularly and scrape the bottom of the pan. Slowly the colour will darken from orangey pink to brownish orange as it cooks. It is like working with molten lava, both in its appearance and its capacity to burn the unwary cook. 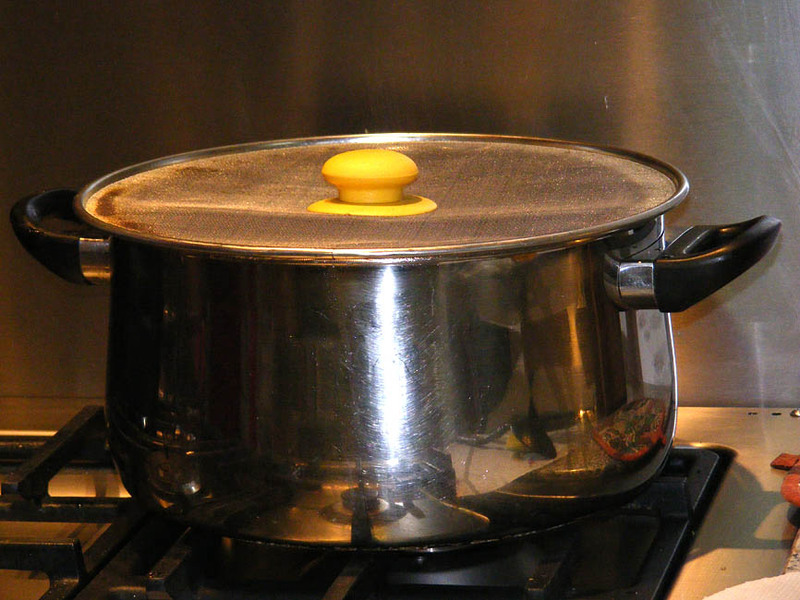 You can't cook it with the lid on because you need to drive a fair bit of water off. To protect against burns and splashes I use a mesh lid on the pan, which allows steam, but nothing else out. Starting to cut the block of paste into rods. Once it has got thick and dark and you are having difficulty preventing it from burning even on the lowest heat, transfer it to a baking tray lined with baking paper. Put it in the oven at 50°C for another 1.5 hours to dry out some more. Then leave it in the fridge overnight to cool completely and set. 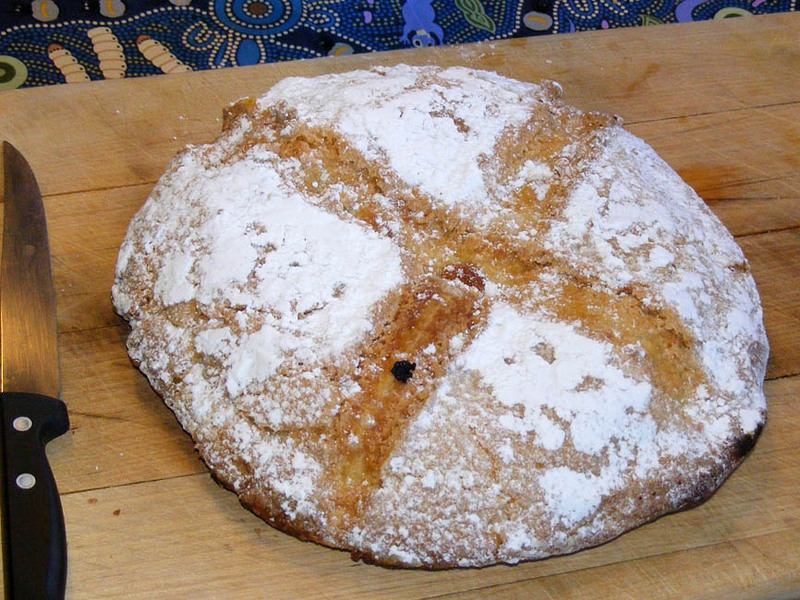 The next day tip it out on to a board dredged in icing or vanilla sugar. Ideally, cut the paste into thick rods with a wire, but a long knife will do. Dredge or roll these rods in sugar, wrap in waxed paper and refridgerate. To serve, unwrap and cut into cubes. Roll the cubes in vanilla, golden castor or raw sugar. All wrapped up and ready to store in the fridge. You can also bottle (can) it by putting it in sterilised jars instead of in the oven. Close the jars and process in a water bath in the normal way. This will give you a paste for spreading on bread like a jam, which is very popular in Spain topped with Manchego cheese. And for those of you interested in maintaining a certain sort of daily regularity, quince paste works as well as the traditional prune. Or something shorts, something a, blue jeans. I can't work out if the most visible piece survived because it was covered, or because it wasn't covered. I also can't work out if it is a "buy jeans from us" advert for a shop in town, or for a particular brand of jeans. 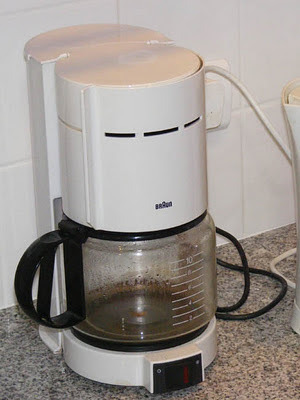 On Christmas day last year our coffee maker died. It hadn't been doing really well for a while but the switch packed it in and as it was a sealed unit - even though I was able to take the coffee maker apart - I was unable to fix the switch. This meant that getting a coffee machine made it on to our list of "fairly urgent things to do". On Tuesday, Huub, Ingrid and Anne-Loes visited for lunch and after the meal we offered coffee, but mentioned that it was made in a fairly haphazard way (boiling water being poured through ground coffee in a filter) because the coffee maker was dead. At which stage Ingrid said something to Huub in Dutch, which I suspect Huub repeated in English, saying they had a second coffee maker that wasn't being used and would we like it? So now we have a very smart looking filter coffee maker that is so much better than our old (12€ from Intermarché) filter coffee maker, which also makes better coffee. Result! Thank you Ingrid and Huub for your kind generosity! Another result is our "tea niche". 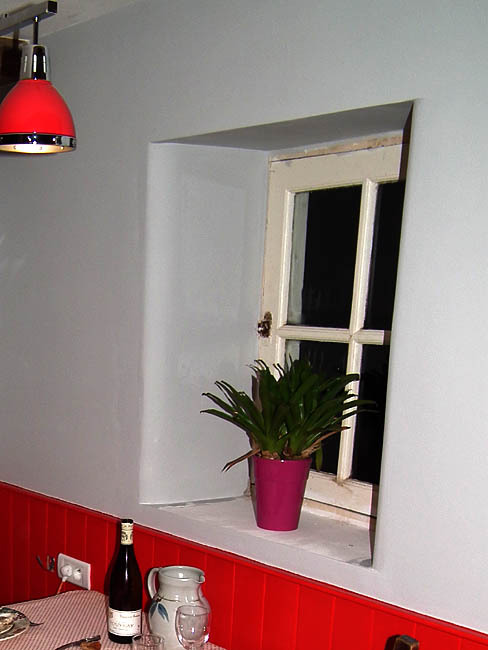 Our kitchen isn't square: the wall against which we have the sink hits the laundry wall at an angle of 14.8°. 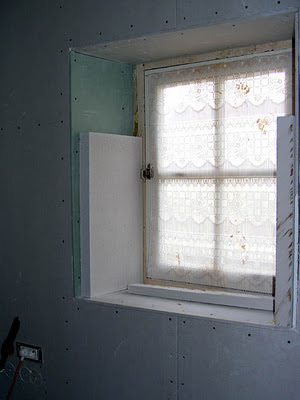 This meant that we were going to have to have a stretch of "filler" - a blank panel - to fill the gap between the end of the cupboards and the wall to make it look all neat. Then I had a though and asked Stéphane to custom build us a little angled cupboard to fill in the gap. 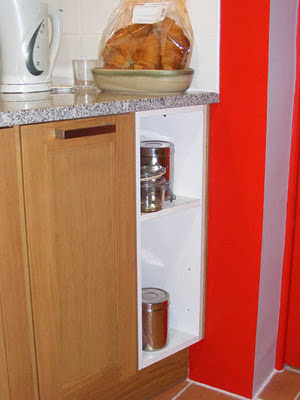 This cupboard has no door, but is perfect for keeping teabags, a small sugar bowl and a teapot in close proximity to the kettle. This means that we have used an otherwise unusable space and that when uncle Geoff visits he can access tea constantly throughout the day without have to find the makings. ... a couple of years make. Not the house this time, but the weather. 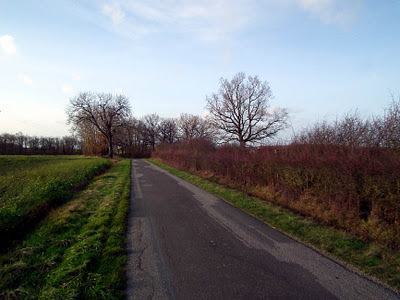 These photos are taken from almost the same place and looking in the same direction, the difference being I was on opposite sides of the road. 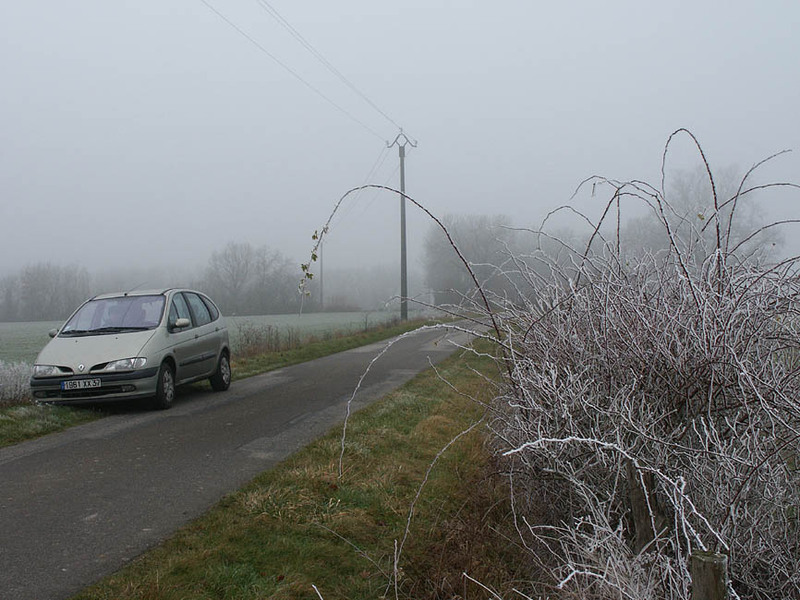 The difference in weather is alarming: on 31st December 2008 the maximum (maximum!!) temperature was 0°, with a minimum of -3°, on 4 January 2012 the maximum temperature was 10° with a minimum of 5°. If we had been along this road on 31December 2011 we would have been experiencing a record temperature for this date: 13° maximum and 9° minimum. I know you shouldn't confuse weather with climate, but it makes you think. 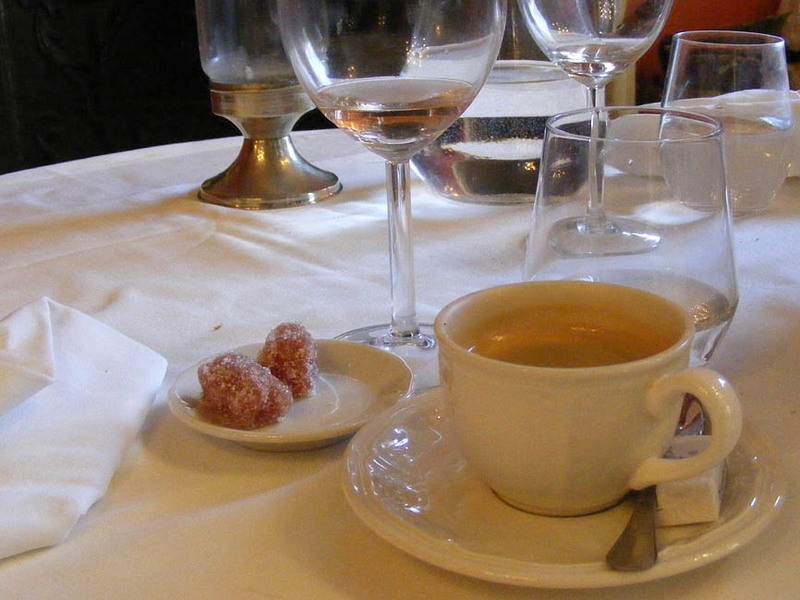 Being served a Pineau pre-lunch* at the Abbé Proust's the other day reminded me that I have meaning to write about this less well known aperitif for some time. 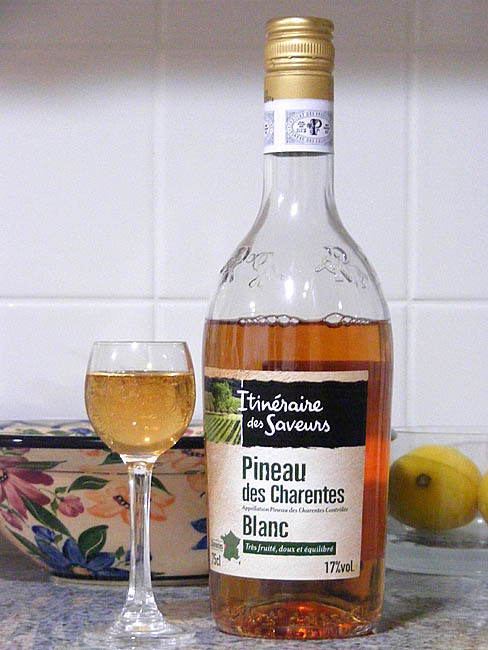 Pineau is associated with the Charente, the area to our south-west, and is a fortified wine, somewhat similar to sherry. 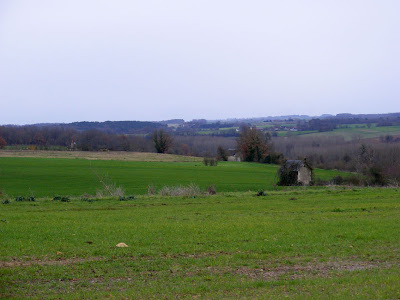 I first encountered it in its heartland, 9 years ago, when we stayed with a friend who has a house in the Charente, before we had bought our own house. His neighbours invited us to apéro and the men were expected to drink Ricard while the women were offered Pineau (in fairly generous tumblers). I was deeply grateful not to have to drink Ricard, and have been benignly disposed towards Pineau ever since. I find it a pleasant drink, sweetish and smooth, but not one I think to serve regularly. Here in the Touraine it is also widely available and popular, but it is not, strictly speaking, a local drink, nor is it made locally. 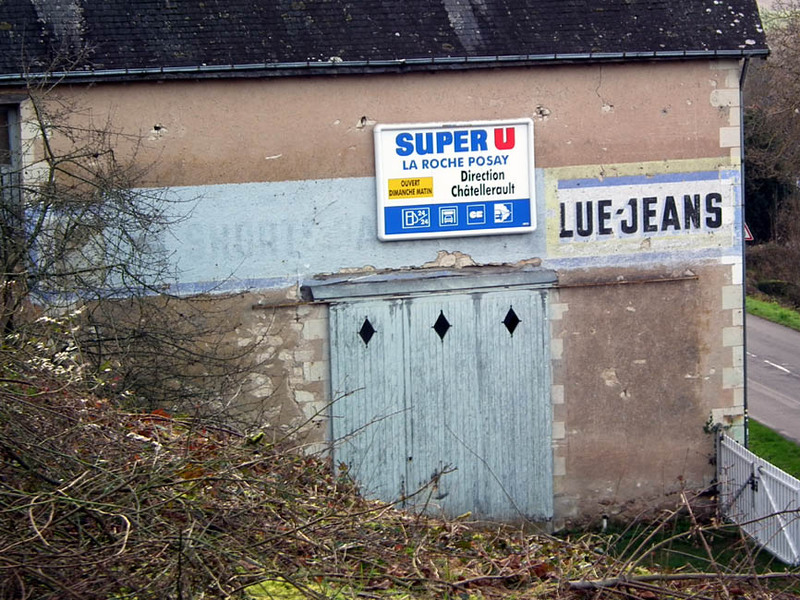 It is made in much the same area as cognac is made, and many of the producers are also cognac producers. The drink is a blend of newly fermented grape juice and cognac which is then aged, resulting in a fortified wine. It comes in white (actually a tawny colour) and red (mahogany brown). An opened bottle will keep indefinitely in the fridge, and it should be served chilled. Outside of the Charente and the adjoining regions, you don't see Pineau much, and it is not well known outside of France. *Lunch was a wonderful renaissance style poule au pot, cooked in the open fireplace. At the beginning of last month we started the final phase of the dining room by lining the walls with lambris. There are all sorts of different materials you can get for this, from really cheap pine tongue and groove to pre-formed panels. We went for the not quite cheapest tongue and groove. 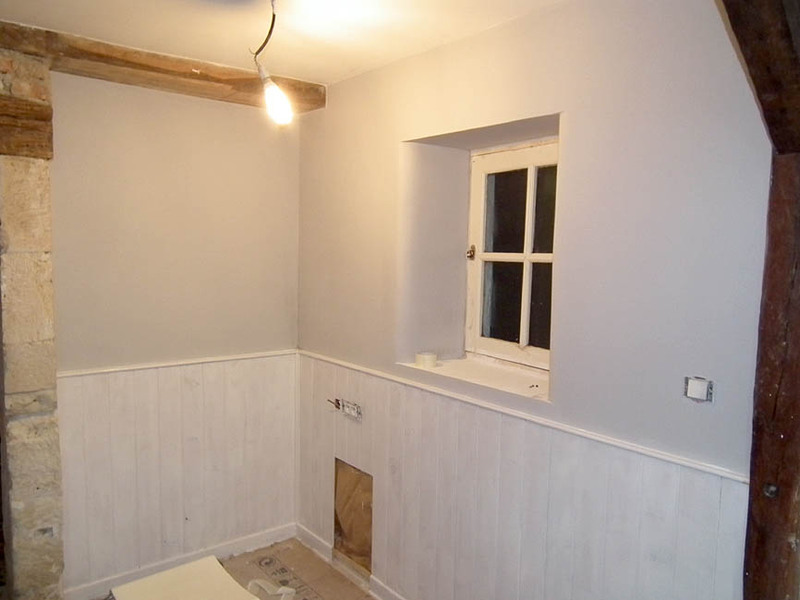 There are two reasons for putting bits of pine on walls, the first of which is the reason the whole kitchen area had lambris when we bought the house: cacher la merde du chat. 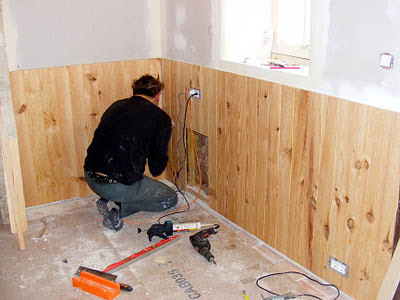 If you have an area of wall that is a mess all you need do is put a layer of cheap pine over it and (for a while at least) the wall will look good. The second reason for using lambris is to protect the plasterboard from knocks and dents, particulary useful in an area just slightly too small for the number of chairs you might potentially want there. To properly install lambris you dont just nail it to the stone wall, as was done previously in this house. 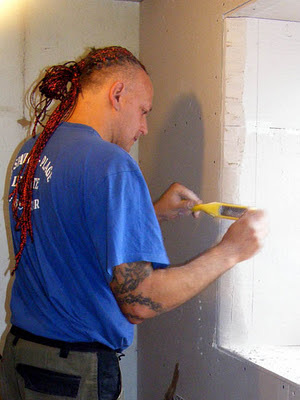 You want air to circulate between the panels and the wall, so you put in battens and nail the panels to the batten (as can be seen here). Once the lambris is nailed to the battens you have to finish it with a top rail, and put a moulded corner piece in. As is usual with these things, the actual lambris was the cheapest part of the whole operation, with the battens and mouldings more than doubling the cost. Once the lambris is installed you have to use some sort of plastic wood (or plaster) to fill in knot holes. If you have bought the cheapest pine this will take you an age, as the cheap stuff really is rubbish, with holes through every piece of wood. We paid 2€ a metre more and only had 4 knot holes to fill. After that you need to sand and undercoat (which didn't dry, duly provoking a reaction, here) and paint (which didn't go on properly, as mentioned here). 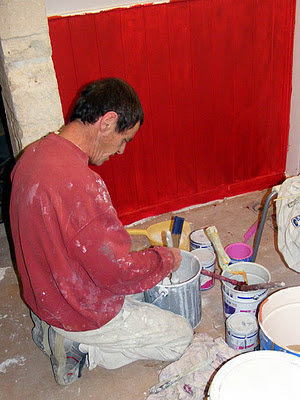 We like our lambris - painting it the same colour red as the end wall of the kitchen has tied the kitchen and dining room together, and it means the walls should be protected from damage from big clumsy blokes not fully in control of a chair. For a photo of the finished article, there is no better place to look than here.